After spending the winter months in Mexico or Central America, male Ruby-throated Hummingbirds (Archilochus colubris) typically arrive in the United States and Canada beginning in late March--earlier along the Gulf Coast, later in New England and Canada. The first females typically begin returning 7-10 days later than the earliest males. In the interval between those arrival dates, the males are busy checking out potential breeding territories, establishing them, and defending them against intruders. As Ruby-throated Hummingbird (RTHU) females arrive, males attempt to attract their attention with spectacular courtship flights in which a male flies upward 15m or more and then dives down at top speed, pulling up at the last moment to complete a U-shaped pattern; the pattern is usually repeated several times before the male takes a break. The sound of the male's wings are particularly loud in courtship flight, which may be accompanied by vocal chittering. Eventually, the female selects a male--perhaps one with a particularly energetic display or the one defending a feeding territory that appears especially rich--and mates with him. After the male mates with the first female, he may mate again with several others. This promiscuous "harem system" works well for the species because there are fewer adult males than females in a typical local population of RTHU. As soon as mating is over, the female Ruby-throated Hummingbird has little to do with the male, or vice versa. She selects a suitable place for her nest--often atop a small downward-slanting branch overhanging an open area or stream but sometimes on a large horizontal limb--and then spends many hours collecting spider webs and plant parts that she weaves into a small cup about with an inner diameter of about 4cm; the outside of the nest is about 6cm tall. Adorned with bits of gray-green lichen that camouflage it perfectly, the nest is lined with soft plant down, and within a few days the female lays the first of two tiny pea-sized (8mm x 13mm) white eggs. Occasionally there is only one egg in the clutch, but almost never are there three; apparently two is the optimal number of chicks the female can care for, and having three demanding nestlings would probably lead to the death of all the young. 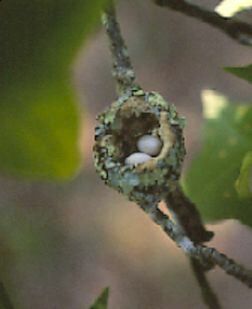 Almost without exception, the female Ruby-throated Hummingbird (Archilochus colubris) lays two tiny white eggs in her nest. Only one egg would not maximize the female's reproductive potential, but three would produce too many chicks for her to care for successfully. The nest, constructed from spiderwebs and plant parts, is adorned with bits of lichen that make the nest very difficult to find. Incubation lasts about 14-16 days--perhaps as long as 21 days in cool weather--during which time the female Ruby-throated Hummingbird is on the nest for about 50-55 minutes out of each hour. When the chicks hatch, they are about 2cm long, altricial (naked), and with very short bills. For several days they are unable to generate their own body heat, so the female must deal with the conflict of gathering food for them while not being off the nest for long stretches. It is suspected the male with whom she mated allows her passage into his feeding territory, so she does not have to search far for food and her time off the nest is minimal. In RTHU, the male is not known to care for nestlings in any way. When the female RTHU does leave the nest to forage, she collects nectar, pollen, and tiny insects in her crop and returns to the nest, where she regurgitates the energy-rich slurry into the mouths of the nestlings. By the third day after hatch, the chicks have doubled their mass, which doubles again by day five and again by day eight--about the time when the young start producing their first noticeable pinfeathers. Chicks are in the nest for almost three weeks--making the total elapsed time from egg-laying to fledging about 5-6 weeks. When the nestlings finally leave the nest, they are completely grown and innately able to begin foraging on their own. They make lots of mistakes at first as they explore their new world, probing at anything that looks like it might contain food. Eventually, those that are successful will have fine-tuned their interactions with the environment and live to produce yet another generation of Ruby-throated Hummingbirds. in York County, South Carolina. Curiously, a female hummer--perhaps the same bird--built a nest in the same tree the previous year. 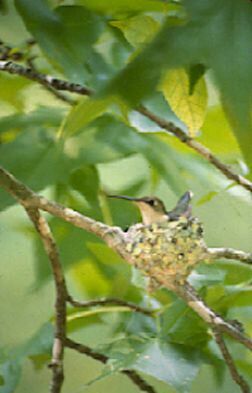 Occasionally, because of cold, wet weather that kills the eggs or nestlings, or when windy storms blow down a nest, the female Ruby-throated Hummingbird will start the nesting process over again. If she returned from the wintering grounds early enough and linked up quickly with a male, she probably has no problem pulling off a re-nesting attempt, but if she got a late start on her first nest she may not have time to try again--especially in the northern United States and southern Canada where the nesting season is especially short. In the southern U.S., however, females have plenty of time for re-nesting; in fact, if an early-nesting female is successful with her first attempt she may even have time to double-brood (pull off a second brood) during one nesting season, and there's a possibility RTHUs could even triple-brood in Florida and the other Gulf Coast states.